‘Image enhance’ just got a little more real, for microscopes at least. A team of researchers form UCLA have developed a new sensor and software that turns an optical microscope into a super-resolution imaging device. 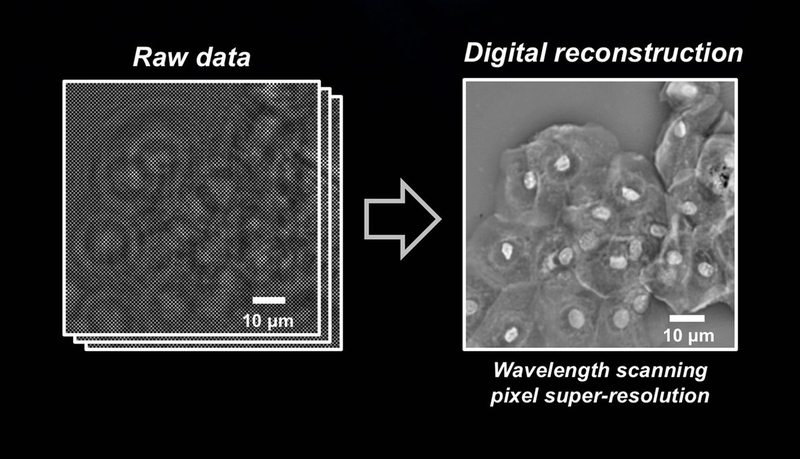 The new system is referred to as “wavelength scanning pixel super-resolution.” That sounds rather complex, but it’s simple enough: a new kind of sensor captures a stack of separate images, each at a slightly different wavelength of light. Then, software is used to create sub-pixels from the information based on the frequency of light that’s captured. In the image below, you can see the raw data captured by the sensor on the left, and how it looks after it’s been run through the software on the right. So far the team has tested the technique out on samples of blood cells and cervical smear tests, which also hints at its intended use. The team reckons the device could be retrofitted to devices where budgets are tight—such as clinics in developing countries.